Maldivian President Abdulla Yameen Abdul Gayoom, center, addressed his supporters Saturday. 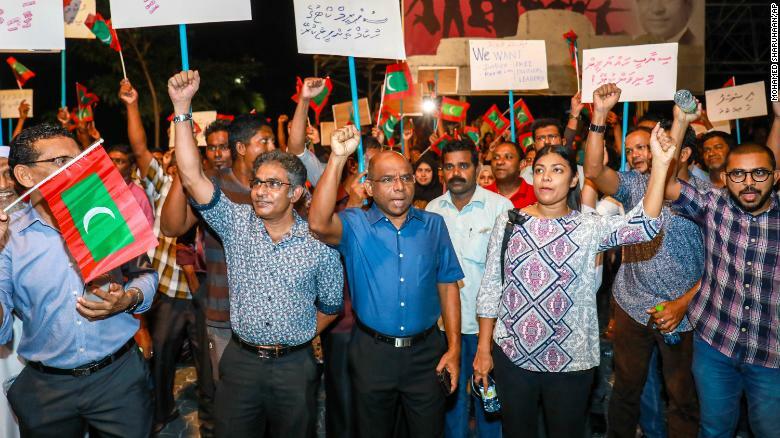 (CNN) Political unrest in the Republic of Maldives prompted the Asian nation’s president on Monday to declare a state of emergency for 15 days. 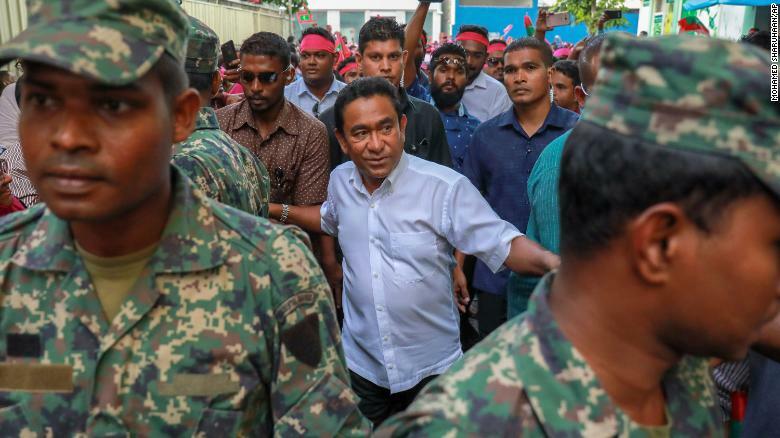 The move, which gives President Abdulla Yameen Abdul Gayoom power to arrest and detain people, reflects a power struggle between the island nation’s Supreme Court and its government. “During this time, though certain rights will be restricted, general movements, services and businesses will not be affected,” said a statement from the office of the President. The court last week ordered the release of political prisoners and the reinstatement of elected members of Parliament that would give the opposition majority power. But President Yameen has rejected adhering to the court order. The Maldives attorney general on Sunday advised law enforcement to uphold the constitution and warned that the Supreme Court may “issue a ruling to impeach the President,” according to a press release from the Foreign Ministry. Opposition supporters have staged street protests lobbying the government to obey the court order and have urged the international community to do what it can to persuade the government to obey the ruling. Maldivian opposition supporters take to the streets Sunday to urge the government to obey the Supreme Court. China, the United Kingdom and India have issued travel warnings to Maldives. “Security forces have been deployed in the capital Malé in response to political developments. If you’re in Malé, you should exercise caution and avoid any protests or rallies,” said the UK in their advisory. A July 2017 population estimate in the CIA World Factbook said more than 392,000 live on the Indian Ocean archipelago, a popular tourist destination. CNN’s Sarah Faidell and Joe Sterling in Atlanta and Sugam Pokharel in New Delhi contributed to this report.